I had the privilege the other day to hear +Will Richardson speak as the keynote for the first day of the TL21C Program. His mantra for his presentation was to leave teacherse feeling confused and uncomfortable, yet inspired. He basically spoke about the divide that is growing between learning at home and in schools. Often if we want to teach something in school today, we structure it in a way that fits our needs and structures. That is our timetables, our assessment structures, there is little room to simply fly ahead. Whereas outside of this environment, if someone wants to learn something they just immerse themselves in it, find out what they need and go ahead and learn it. Modern learning is not about being aware of everything, but about being aware of the options. The message that Richardson came back to again and again was that we need to make what we currently do different, not better. Things need to change. I had heard this message before, whether it be via Sir Ken Robinson’s many TED Talk videos or the work of Seth Godin, especially his video on education reform from 2013 WISE Summit. While I agree that the system is flawed, I am always concerned about the appeal to revolution. For ideals are not always ideal and they are often far from practical. I recently wrote a post titled ‘What Digital Revolution?‘ in which I explored some of the criticisms and promises often associated with the introduction of technology into schools. In response to this, +Bill Ferriter wrote a great comment and subsequent post in which he asked the question: do you really need to do new things in new ways? Basically, Ferriter’s argument is that technology should not automatically more to transform teaching. This, he suggests, implies that everything that we do and have done is flawed. However, according to Ferriter, this argument is somewhat flawed. Instead, technology makes interacting with the higher order thinking skills that so often define successful people easier for everyone and it is these skills that are in a higher demand in the 21st century. +Corrie Barclay also recently continued with this theme in his post ‘Time Changes Everything … Or Does It?‘ In it Barclay explores the changes in education over the last fifteen years and comes out with the feeling that there has been very little change. Although education itself has become busier, leaving little time for those inadvertent and incidental activities such as kicking the football or chewing the fat, little has really changed in regards to the art of teaching and instruction. Although I agree in some respect that little has changed in regards to quality teaching and instruction, I would argue that where change has occurred over the last few years is in the act of learning. Whereas in the past you were often restricted to those resources available to you, with access to the internet you are now able to find out anything (to a degree) in seconds. As Richardson stated in his presentation, learning is no longer about the scarcity of knowledge, but instead about dealing with the abundance of information. This is a point that +Bec Spink‘s made in her essay ‘Teachers – Modern Knowledge Workers for the 21st Century‘. Borrowing from the work of Michael Wesch, she stated that in the 21st century we need to “develop strategies for engaging with, working with and constructing new knowledge”. 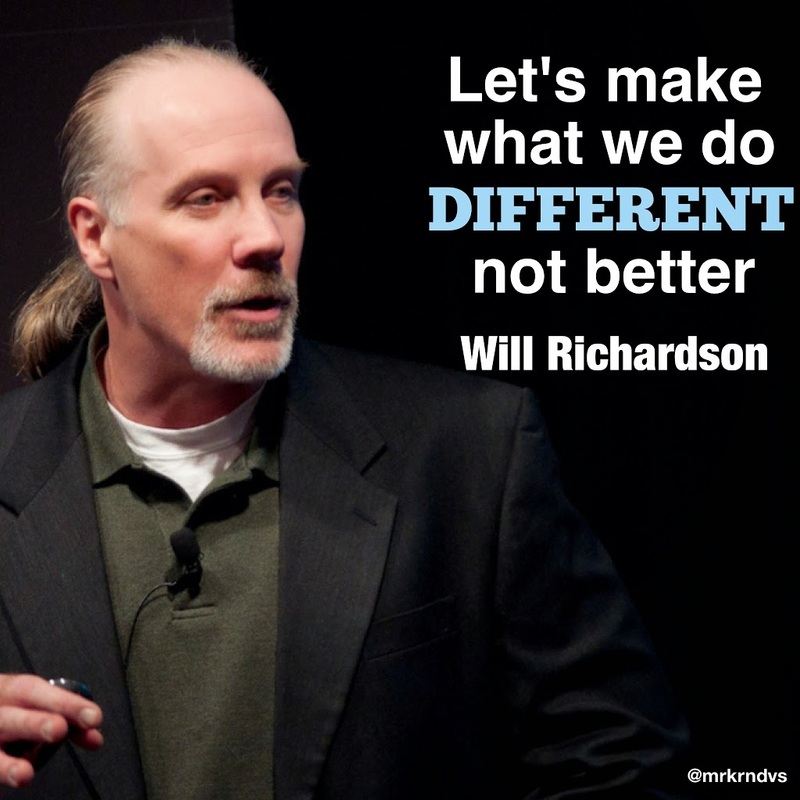 The reality then is that we do need to do things different as Richardson suggests. However, the difference is redefining the teacher as a facilitator and learner in the classroom. It is what constitutes learning that is the greatest challenge and it is here that we need to start. How have your practises as a learner changed with technology? How does learning with and through others influence you? Please share, would love to know. Different, Not Better – Reform begins with Teachers Becoming Learners by Aaron Davis is licensed under a Creative Commons Attribution-ShareAlike 4.0 International License.